Bengaluru: Deploring the unprecedented assault on the values and democratic institutions of India by the ruling government, anti-corruption crusader Prashant Bhushan gave a clarion call to the foot soldiers of Swaraj Abhiyan and other movements interested in social justice, equality and democracy to connect and engage with the people at grassroot level to end corruption and wage a relentless war against its many vicious facets in electoral politics. 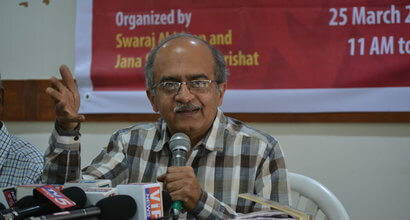 Eminent Supreme Court advocate Prashant Bhushan, who is also the president of Swaraj Abhiyan, a social movement and a political forum to restore the rights of the citizens of India, spoke at length about the `Politcal Corruption and Dangers to Democracy’, a talk organised by Swaraj Abhiyan and Jana Sangrama Parishat here on Sunday. Though it is a choice between the devil and the deep sea, BJP is a far greater evil in Karnataka,” he exhorted commanding all democratic forces to join in advocating for transparent, corruption-free governance ahead of the Assembly Elections. He pooh-poohed the tainted Reedy brothers joining the BJP campaign despite their bleak and black record in the mining looting that went on for years in the State. All the democratic institutions are being destroyed. Central Vigilance commission, Central Bureau of Investigation, Media, et al. Bringing the allegedly corrupt and those with tainted history as saviours of corruption has eroded the existence of the watchdogs of corruption,” he added. For a long time the CVC three-member team was largely vacant. After a petition was filed in the SC that the vacancies were not filled, members with questionable integrity were nominated. Likewise, the Special Director of the CBI appointed by the BJP government had an ongoing investigation against himself, he revealed citing the appointment of Rakesh Asthana, an 84 batch IPS officer from Gujarat, who himself was under the scanner of CBI. The respected lawyer, who along with Yogender Yadav are spearheading Swaraj India, the new political outfit advocating for clean and honest politics, also exposed the BJP governments finance bill which nullified the limit of 7.5 percent of profit of corporate that can be funded to political parties. “When we are talking about transparency in funding to political parties, the Electoral Bonds have become an instrument of changing black money to white. They are bearer bonds with no name or serial number,” he said quoting a Rafael deal that priced the machines three time over. “Bonds are given to a party and they cash it. And no one knows where the money came from, even if it is a clear kickbacks on the deals.” Is the government that promised to bring back the Black Money, actually promoting Black Money, the Kala Dhan, he questioned! The Bengaluru based Hindustan Aeronautics Limited (HAL) is replaced by a bogus one-year old Ambani firm `Reliance Defence’ for the Rafael deal and they protect the corruption by invoking a `secrecy agreement’ with the French government, which appears ridiculous for me when you are talking about the public money laundering to the tune of 10,000 crores of rupees. The celebrated public figure known for his no-nonsense and honest approach broached several other topics like proprtional representation, Lokpal, Santosh Hegde’s report in Karnataka, unending scams of Nirav Modi, Choksi and Mallya, and patiently replied to the questions of the Media, who flocked to the hall attended by over 200 audience. Hiremat of Jana Sangrama Parishat, who spoke about the corruption and need to cleanse the political system in Karnataka, chaired the meeting. Nisha Gulur, a transgender leader from Swaraj Abhiyan and a founder member of Swaraj India anchored the programme in Kannada. Pratima Nayak, State Committee member of Swaraj India, film actor Kishore and others from Swaraj Abhiyan and Jana Sangrama Parishat were also present. Mr Bhushan left for the Youth4Jobs programme in the city after a quick and well-attended press conference. Swaraj Abhiyan’s political wing, the Swaraj India, recently launched the all India farmers MSP Satyagraha agitation from Yadgir with Yogender Yadav launching the combined movement for farmers. The party is expected to announce its manifesto and the first list of 7 to 10 candidates in a few days for the Karnataka Assembly elections including the support to a couple of independent candidates after the loss of their respected farmers’ leader Puttanaiah.